Saturday May 3 Pam Heath and Dr. John Mills delivered a very special gift to Reuben Nesom the pork manager at Townsend farm in the form of a one of a kind extremely rare large black pig. Dr. Mills is the chair person from The Rare Breed Society of Canada and Pam Heath is the President of the Large Black society in Canada. 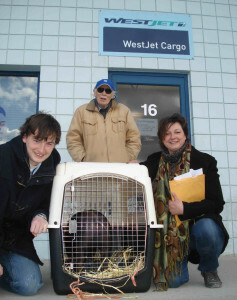 The gift which was presented to Reuben at the Winnipeg International Airport was originally a donation from a local heritage breed farmer in Ontario, Andy Sprosdon from Grimbsy. The large black pig was originally brought to Canada from England in the late 1800’s and was a popular breed due to its superb taste and docility but has declined in numbers since the end of WWII when industrialized pork production became the standard practice. 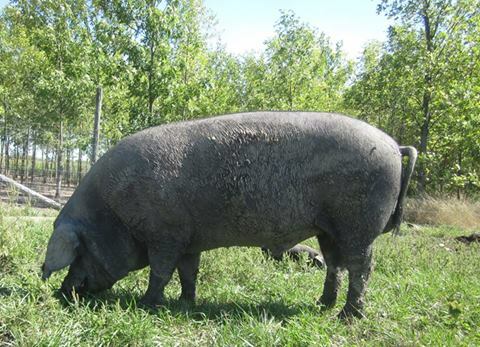 The Large Black Hog/Pig is on the Rare Breeds of Canada Conserving Livestock list listed as Endangered (36- 115 Canada wide) it was on the critical list (1-35 new females) as of last year. This means the large black is now more endangered in Canada than the panda in China or the White Rhino in Africa. This breed is special due to its ability to forage on pasture with ease and live without shelter in our colder Manitoba climate. 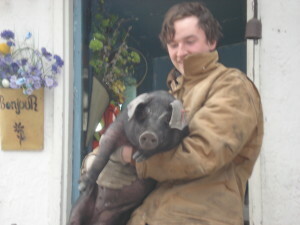 This Breed is very docile and especially friendly, and has superb pork marbled with a great layer of flavourful fat. The meat produces excellent bacon & it’s especially known in Europe for its huge delectable cuts made into Italian Prosciutto, Pancetta & Capocollo. Andy has sent out the last of a legacy of his Large Black Pig “Bob” of a rare genetic line here in Canada. Andy has worked closely with the Large Black Society & Rare Breeds of Canada to regain the genetics here in Canada of the Large Black Pig. This donation of the last of his line pig was put on a plane from Montreal to Winnipeg to find his final destination here at our Townsend Farm in Woodridge Manitoba. This is a desperate last act of a dedicated farmer trying to save the breed. Only a handful of farmers are left around Canada who own large blacks and to find genetics here in Canada is as John from the Rare Breed Society expressed “harder than finding hen’s teeth”. 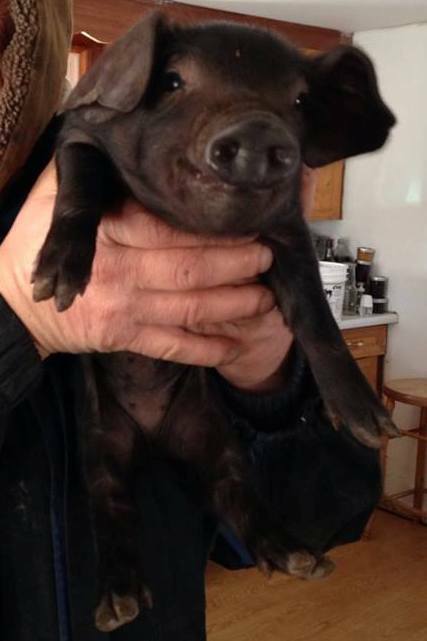 We here at Townsend Farm are so excited to be included in this opportunity in assisting in the breeding of this lost beautiful pig and to help bring this pig out of danger of extinction and expose other small hobby farmers to this adaptable great pig. We hope to have great success with him. He will be joining the other registered large blacks here on the farm; Stovikor our boar and our 2 sows, Pam and Odette. Both John & Pam were excited to know someone as young as Reuben who is almost 17 has committed himself to taking on this great and important undertaking. They are happy to know a new younger generation is carrying on this legacy and they have great hopes for the Large Black’s future.